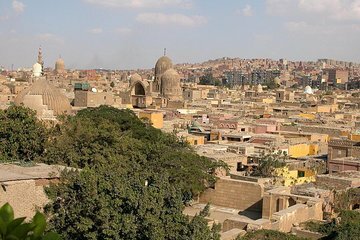 A unique blend of cemetery and residential neighborhood, Cairo’s City of the Dead is a fascinating place to explore. Visit its shops, tombs, houses, and mausoleums on a 4-hour, private tour for your group of up to 15 people. This guided experience includes round-trip hotel transport, and a trip to the Mosque of Ibn Tulun, one of the oldest mosques in the city. Comience con la recogida en su hotel de El Cairo o Giza, y viaje a la Ciudad de los Muertos en una minivan con aire acondicionado que está equipada con Wi-Fi y con agua embotellada. Visite el vecindario a pie con un guía local y conozca la historia del cementerio, que se ha utilizado durante más de 1,000 años. Disfrute de escenas de la vida cotidiana aquí, donde las tumbas se han transformado en casas para la vida, bienes raíces valiosos en una ciudad atestada y creciente. Pasee por las calles llenas de tiendas y niños jugando, mientras los no residentes visitan las tumbas y mausoleos de sus familiares fallecidos. Continúa hacia la Mezquita de Ibn Tulun, una histórica mezquita que fue encargada por Ahmad Ibn Tulun en el siglo IX. Según la leyenda local, la mezquita está construida en el sitio donde se arraigó el arca de Noé después de una inundación histórica, e incluso los minaretes y la arquitectura de la mezquita están rodeados de mitos e historias locales. Después de visitar la mezquita, realice el viaje de regreso a su alojamiento, donde concluye este recorrido. Don't book this tour! The price for this tour is way too high for what you get. My tour was only 2,5 hours with driving time. The tour guide was a nice man and he tried his best but I felt a bit uncomfortable with him touching me the whole time. The mosque itself is really beautiful but not for 60. The actual city of the dead is just visiting one or two buildings and if you are lucky a home of a person who lives there, the rest is a 2 minute ride through a small portion of it. Our tour guide Mady was extremely knowledgable and was able to teach us a lot of stuff ans challenge the knowledge we did know already. He was very attentive to our needs and made sure we had the opportunity to ask questions and review our own curiousities of a new culture and religion. The city of the Dead was interesting to see, it is a pretty quick drive through but the history of it was very interesting to learn about. Unfortunately another tour that our money was wasted on. Our tour guide told us that this tour was in bad taste. She said that the people that live in the City of the Dead were not happy to have us in there area. They feel that this tour was being taken to show them little respect for their living conditions. Please save your money unless you don't mind feel very demoralized. Great guide, charming, very animated and informative, I really enjoyed talking with him. My only complaint was that the tour was too short. It was supposed to be a half day tour and it was only 2 and a half hours including travel time, so I saw very little of the City of the Dead, it would have been nice to see more, shops in the cemetery. Mady Osama you LEGEND !!! What a fantastic tour with you, your knowledge of Egypt is fantastic! I would return to Egypt just for your tour again. I will see you soon wnen you come shark diving here in South Africa. Visites intéressantes avec une guide extrêmement cultivée et férue d'histoire ! Un bon moment ! This tour was absolutely fantastic and I would highly recommend it! Out guide went above and beyond to make us feel welcome and show us around, even organising us an evening dinner cruise as we had no other plans. really highly recommended! Shokran habibi!